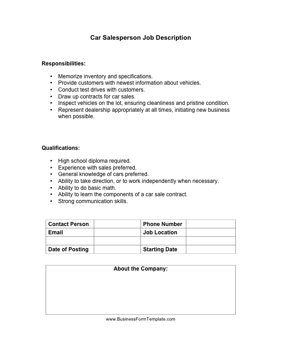 New and used car dealerships can use this car salesperson job description to advertise for new employees both online and in print. Provide customers with newest information about vehicles. Conduct test drives with customers. Draw up contracts for car sales. Inspect vehicles on the lot, ensuring cleanliness and pristine condition. Represent dealership appropriately at all times, initiating new business when possible. General knowledge of cars preferred. Ability to take direction, or to work independently when necessary. Ability to learn the components of a car sale contract.